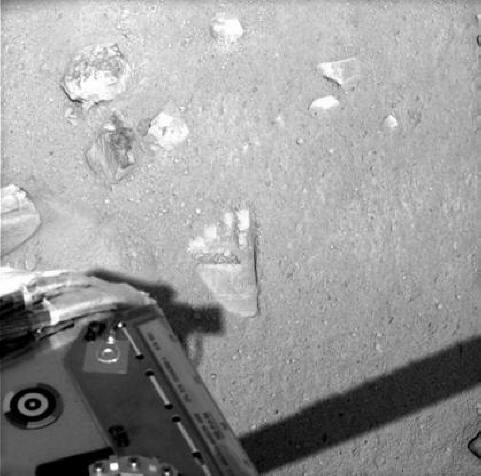 Impression in the Martian soil of the robot scoop onboard the Phoenix lander. The significance of life on other planets leaves many unanswered questions. The universal feeling that man is unique has been challenged by the final photographs sent by Mariner IV just before her solar energy package failed. The last twelve photographs showed the usual Martian landscape and a set of footprints clearly discernible in the Martian dust. Scientists and government leaders from all over the world are gathering to discuss what action is to be taken. The Communist Bloc Countries, headed by the USSR, are considering a joint venture to land a large exploration party on Mars within the next year. The United States, backed by her allies, is opposed to this plan; preferring to orbit a space station for observation and communication. Whatever decisions are made as to the course of action, questions arise that need to be answered. The fact that the footprints were not discovered until just before the power pack went dead has led some scientists to deliberate that it was a purposeful act on the part of the owner of the footprints. Mariner IV has been on the Martian surface for the past twelve months, an obvious intruder to any inhabitants. Was it an accident or was it an intentional act that caused them to wait this long to make their presence known? Theologians have been expounding for two thousand years that man is unique in the universe, made in the image of God. It is clearly evident from the broad, three-toed footprints that whatever left those tracks was definitely not in the image of man. Unless other explanations can be found, it is certain that Christians (and other religious groups) will have to alter their way of thinking and admit to the possibility that they are not alone in the universe. Two questions come to mind: Are the creatures on Mars capable of thought and reason; are they made in the image of God? A complete exploration of Mars is imminent. The question now is, how do we explore it? Do we go in peace or do we go armed to the teeth ready to do battle with whatever or whomever we may encounter? Certainly the first expedition will be armed to some extent, but how far are we willing to go in the use of arms? If the history of exploration on the North American continent is an example, then any inhabitants of Mars will not stand much of a chance. The Inca, the Aztec, and the American Indian can attest to that. Vital questions remain to be answered. Is there an intelligent race on Mars, or were the footprints left by a member of another exploring party from a civilization beyond our galaxy? If this is the case, what are they doing on Mars? It would not have taken them long to realize by the existence of Mariner IV that another intelligent race was close at hand. Finally, what will their intentions be? The final answer to any situation cannot be known until all the facts are known. Let us hope that after we have analyzed all the facts and have determined what course of action to take that the final solution will be a mutual one for us and whomever we encounter on Mars.